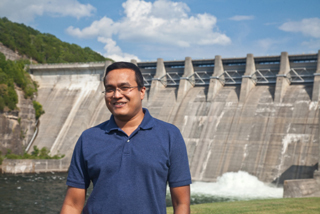 (11-Dec-12) Dr. Faisal Hossain has received the 2012 AGU Charles S. Falkenburg Award. This award is bestowed annually to a scientist under 45 years of age who "has contributed to the quality of life, economic opportunities and stewardship of the planet through the use of Earth science information and to the public awareness of the importance of understanding our planet." Dr. Hossain received the award at a ceremony during the December 2012 AGU Honors Ceremony held during the Fall Meeting in San Francisco. Dr. Hossain is currently working in Bangladesh on a Fulbright Faculty Award through Spring 2013. His project is relevant to SWOT, as he will be working on the integration of satellite altimetry for improving flood forecasting in an operational setting, and exploring the feasibility of AirSWOT for this region.